Stroll beneath the whispering pines, breeze in your hair, a spring in your step. 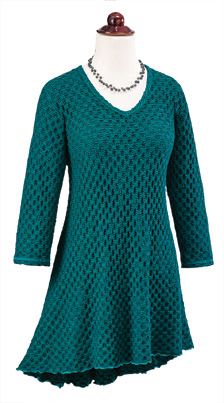 This tunic delights - soft mid-weight knit stretches for perfect comfortable fit, the textured knit in evergreen accented with black is honeycombed for a fun, dimensional pattern of dots. Soft mid-weight fabric puts a little bounce and swing in the asymmetrical hemline. 33" at longest point. Rayon/poly/spandex; machine wash. Sizes XS-XL. Made in USA. Thank you for your speedy service and lovely gift wrapping!